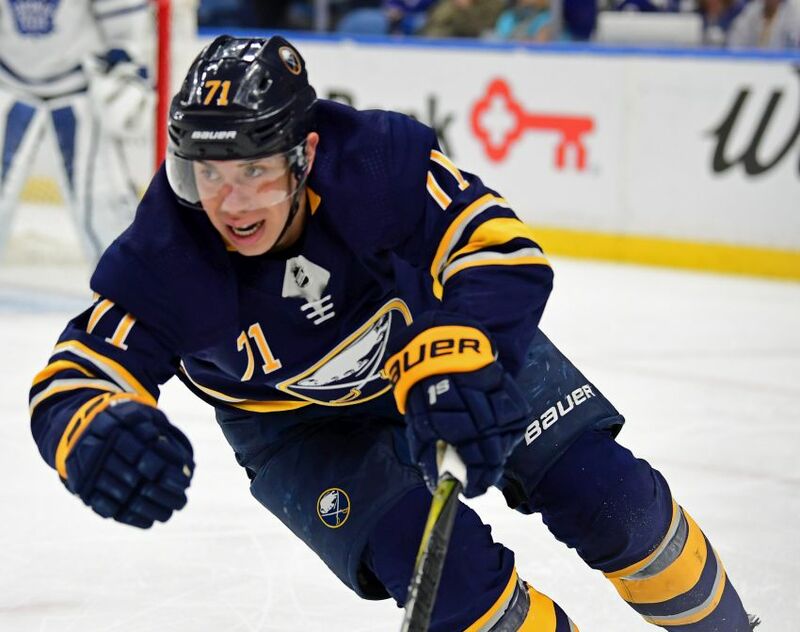 BUFFALO – Before Evan Rodrigues suffered an upper-body injury Feb. 28, the Sabres forward was playing perhaps the best hockey of his three-year career. Less than a month after sitting out as a healthy scratch, he seemed to be putting everything together, showcasing speed, tenacity and the shot mentality Sabres coach Phil Housley constantly stresses. In his last appearance prior to returning for Thursday’s 5-2 loss to the Toronto Maple Leafs, Rodrigues scored and pumped five shots on goal, tying his career high, in a 2-1 overtime win in Tampa Bay. Housley said Rodrigues is at his best “when he plays with urgency,” which he did immediately after the Sabres recalled him in December. Rodrigues enjoyed his first two-goal outing in a 3-2 overtime loss Dec. 10 in St. Louis. But the Boston University product eventually tailed off and was scratched twice. He responded following his last benching, however, compiling four goals and nine points in 11 games before getting injured. He had 11 shots in his last three contests. Rodrigues took more faceoffs Thursday because he played center between Zemgus Girgensons and Nick Baptiste. Rodrigues has switched between the middle and the wing all season, having some success at both spots. He started playing center again when Jack Eichel suffered a high right ankle sprain Feb 10. When the Sabres faced the Leafs here 11 days ago, defenseman Brendan Guhle started his first NHL game in seven weeks poorly. Well, playing sound defensively and slickly moving the puck. The speedy Guhle, 20, offers the Sabres an element they sorely need when he joins the rush. Guhle, the Sabres’ top defense prospect, hit the 10-game mark in the NHL on Thursday. Like any rookie, Guhle’s still raw. But to Housley, the youngster’s growth this season – he has played 47 AHL contests with the Rochester Americans – has been noticeable. Guhle said the Sabres haven’t said much to him about moving up in the play. Guhle played a career-high 17 minutes, 50 seconds in Saturday afternoon’s 2-1 shootout loss to Vegas. Guhle even skated in overtime. Notes: The Sabres made one change on defense, inserting Victor Antipin for Josh Gorges. … Sabres goalie Linus Ullmark was still tending to a personal matter and didn’t dress for the game. … Eichel missed his 15th consecutive game. Leafs center Auston Matthews, meanwhile, missed his eighth straight contest (shoulder).